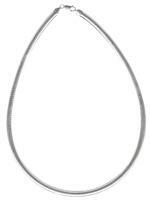 Item #ELY-ENT-120: 14" long Sterling Silver Entwined Chocker Necklace of 49.91 Gms. Item #MN-LC-8: 16" - 18" long 2mm round Black Leather Cord Necklace with 2" Sterling Silver extension and lobster claw clasp. 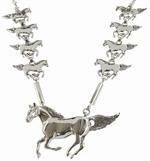 Item #SUR-6MM-16: 16" long, 6mm wide Sterling Silver Omega Necklace of 26.40 Gms. Lobster claw clasp. Item #CH-714-DER-C225: 16" Adjustable Rhodium-plated Sterling Silver Southern Gates vertical balcony necklace with 2" extender and lobster claw clasp. 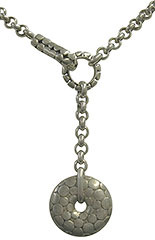 Item #CH-714-DER-C219: 16" Adjustable Sterling Silver Southern Gates southern oak tree of life necklace with 2" extender and lobster claw clasp. Item #QG1306-16: 16" 2mm round Black Leather Cord Necklace with Sterling Silver lobster claw clasp. 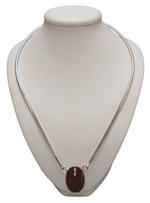 Item #QG1307-16: 16" 2mm round Dark Brown Leather Cord Necklace with Sterling Silver lobster claw clasp. Item #QG1308-16: 16" 2mm round Natural Color (Light Brown) Leather Cord Necklace with Sterling Silver lobster claw clasp. 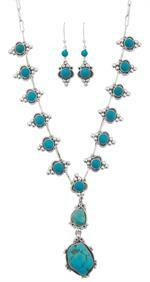 Item #CH-C227: 16" Sterling Silver Southern Gates horizontal leaf necklace with 2" extension. Item #QG1306-18: 18" 2mm round Black Leather Cord Necklace with Sterling Silver lobster claw clasp. 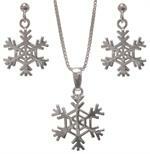 Item #QG-QG3709-18: 18" Sterling Silver polished Christmas tree necklace. Item #QG1307-18: 18" 2mm round Dark Brown Leather Cord Necklace with Sterling Silver lobster claw clasp. Item #QG-QG3914-18: 18" Multi-strand Sterling Silver sideways cross necklace with lobster claw clasp. Item #QG1308-18: 18" 2mm round Natural Color (Light Brown) Leather Cord Necklace with Sterling Silver lobster claw clasp. 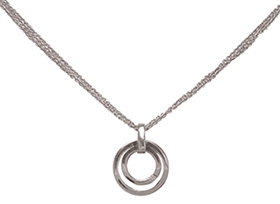 Item #SC-NLDA-1626-X1: 18.5" Rhodium-plated Sterling Silver double strand necklace with double circle pendant, round Diamond of .02 Cts and lobster claw clasp. 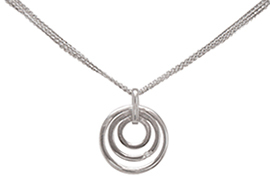 Item #SC-NLDA-1625-X1: 18.5" Rhodium-plated Sterling Silver triple strand necklace with triple circle pendant, round Diamond of .02 Cts and lobster claw clasp. 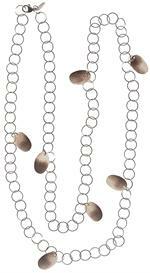 Item #CH-UNO-166: 38" long Sterling Silver Circle Link Necklace with seven Pink Gold-plated Leaf shape Ovals of 16.82 gms. Lobster claw clasp. 16.82 Gms. 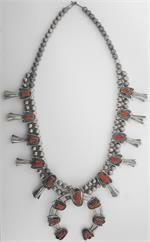 Item #EST-1677: ESTATE PIECE - 24" Sterling Silver squash blossom necklace with seventeen Red Branch Coral cabs. 143.42 grams TW.